Two field biologists and researchers who dedicated their lives to saving elephants were awarded conservation medals Thursday by San Diego Zoo Global. Iain Douglas-Hamilton, founder of Save the Elephants, and Michael Chase, who started Elephants Without Borders, were honored at a luncheon, according to the zoo. Since 1966, the conservation medal awards program has recognized leaders who share San Diego Zoo Global’s vision to end species extinction. Douglas-Hamilton, who started Save the Elephants in 1993, was honored for lifetime achievement. Iain Douglas-Hamilton at the San Diego Zoo Safari Park. 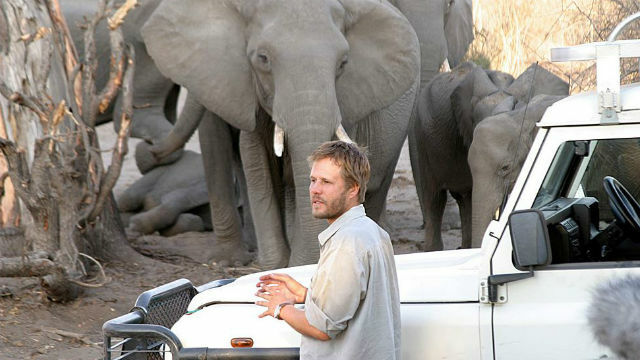 He and his organization have contributed to legislation against ivory trade and importation, and have been leading efforts to end the poaching crisis faced by elephants. At the age of 23, Douglas-Hamilton completed the world’s first in-depth scientific study of elephant social behavior, based on pachyderms in Tanzania’s Lake Manyara National Park. 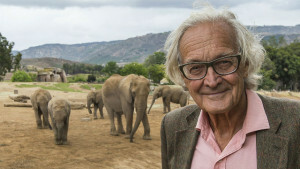 After earning his doctorate in zoology from the University of Oxford, Douglas-Hamilton went on to investigate the status of elephants throughout Africa in the 1970s. The zoo said he chronicled how Africa’s elephant population was cut in half between 1979 and 1989. Chase was honored for “conservation in action” — providing data on the status of elephants and other wildlife, identifying cross-border corridors and discovering new migration routes. He is also the principal researcher who coordinates the Great Elephant Census, which started two years ago, spans 21 countries and is expected to conclude later this year. The zoo said the medals come with a $10,000 cash award.